The complement system is a part of the immune system that is concerned with the innate immunity. It consists of numerous proteins that are activated by several triggering factors and start a chain of events in the human body. Because the pathway finally culminates in the creation of a cytolytic "membrane attack complex", it is a vital mechanism to fight infection. In 1896, Jules Bordet, working at the Pasteur Institute in Paris, demonstrated that the factor in the blood serum capable of killing bacteria could be analyzed into two components: heat stable and heat labile. The heat labile component is what is now known as the "complement." The term complement was introduced by Ehrlich in the late 1890s. In the 1900s, the complement system was understood to be a cytolytic system that primarily lysed bacteria and erythrocytes, which were sensitized with antibody. The complement system is currently known to contain at least 30 different proteins that are primarily formed in the liver and circulate in their inactive form. When activated, these proteins produce various complexes that play a major role in the innate and adaptive immune defense. Deficiency of each component of the classical and alternate pathways is rare and comprises less than 1% of patients with primary immunodeficiency. Deficiency of components of the MBL pathway appears to be fairly common. Deficiency of early components of classical pathways has been associated with autoimmune disease, whereas deficiency of late components of complements lead to increased susceptibility to certain infections. Scheme showing the cascade of events during the activation of the complement system. Nine complement components in the classical pathway are designated by a capital letter C and numbers 1-9. Two proteins that participate in the alternate pathway are termed factors and are represented by capital letters B and D. Proteolytically cleaved components of proteins are expressed by lowercase letters (eg, C2a, C2b). Inactive components are designated with an "i" (eg, inactivated C3b is termed iC3b). The binding of C1 to antigen-antibody complexes that contain immunoglobulin M (IgM) or immunoglobulin G (IgG) antibodies (subclasses IgG1, IgG2, and IgG3) activates the classical pathway. Only these Ig isotypes have complement-binding sites in the Fc portion (CH2 domain of IgG and CH3 domain of IgM). C1 is a large multimeric protein complex composed of 3 subunits: C1q, C1r, and C1s. C1r and C1s are serine esterases. The C1q must bind to the 2 Fc portions of immunoglobulin (Ig) heavy chains to initiate the complement cascade. The binding of C1q to the immune complex leads to enzymatic activation of C1r, which, in turn, cleaves and activates C1s. Activated C1s cleaves C4 into C4a and C4b. A single activated C1s can cleave numerous molecules of C4. This process leads to continuous formation of C4b but is inhibited by C1 esterase inhibitor enzyme (C1INH). Deficiency of C1INH leads to uninhibited formation of C4b and C4a. C4b has an internal thioester bond that allows C4b to form covalent amide or ester linkages with the immune complex or the cells coated with antibodies. C2 then complexes with immune complex or cell surface–bound C4b and is cleaved into C2a (soluble component) and C2b by C1s. The C2b remains physically associated with C4b on the target cell surface, forming classical pathway C3 convertase (C4bC2b) that proteolytically cleaves C3 into C3a and C3b. Once C3 is cleaved, all 3 complement activation pathways share the same terminal complement components (C5-C9). The classical pathway is important in antigen-specific adaptive immune defense because it is activated by antigen-antibody complexes. Complement activation via the classical pathway effectively lyses antibody-coated pyogenic bacteria such as Streptococcus pneumoniae and Haemophilus influenzae and cells coated with antibodies (often microbe-infected cells). MBL is an acute-phase protein. It is secreted by hepatocytes as a part of the innate immune defense and activates complement cascade without antigen-antibody complex. The MBL binds to mannose residues of polysaccharide on the microbial surface. The MBL-associated serine proteinases MASP-1 and MASP-2, analogous to C1r and C1s, cleave C2 and C4, forming C4b/C2b C3 convertase. The terminal components of complement are then activated. The MASP-1 can also directly cleave C3. The MBL has high structural homology with C1q protein and can bind with C1r and C1s, with subsequent activation of C4 and C2. The MBL pathway is generally thought to provide initial antigen-independent immune defense by rapid activation of complement cascade, directly recognizing sugar residues of microbes. This pathway is activated by the combination of factor B, factor D, and properdin. Properdin was first described by Pillemer and colleagues, and its main function is to stabilize the alternative pathway convertase. It is also referred to as factor P. Factor B is a single polypeptide chain glycoprotein with a molecular mass of 93 kDa and is the zymogen of the alternate pathway C3/C5 convertase. Factor D is a 24-kDa single-chain serine proteinase. It is present in the concentration of 1.4-2.2 mg/L, but the levels are increased ten-fold in patients with renal failure. Large amounts are found in the urine of patients with proteinuria, in particular those suffering from Fanconi syndrome. C3 in the plasma is continuously cleaved at a low rate (C3 tick over). If active C3 (C3b) attaches to the cell surface that lacks complement regulators, it permits rapid amplification of the complement cascade. Namely, factor B binds to C3b bound to the cell surface by forming amide or ester bonds. Factor B is then cleaved by factor D to generate Bb, which forms alternate pathway C3 convertase (C3bBb). Properdin stabilizes the C3bBb complex. After the C3 convertase cleaves another C3 bound to the convertase, C3b combines with C3 convertase complex to form the alternate pathway C5 convertase. The C5 convertase further activates C5 to C5b, and sequential binding of terminal components C6, C7, C8, and C9 forms the membrane attack complex (MAC). The alternate pathway, along with the MBL pathway, plays an important role in innate immune defense in an antigen-independent manner. Moreover, even when C3b is generated by the other two pathways, it can form a complex with Bb that can further cleave more C3. Thus, the alternative pathway C3 convertase also amplifies complement activation initiated by other pathways. The central event in complement activation is proteolysis of C3, which produces C3b and C3a. As described above, C3b that is covalently attached to the cell surface or antigen-antibody complex initiates late steps of complement activation common to all 3 pathways, leading to the formation of lipid-soluble pore structures of the MAC. Along with C5a and C4a, C3a functions as an anaphylatoxin, inducing degranulation of mast cells and basophils. They also function as chemotactic factors for leukocytes. C3b is cleaved into C3d, C3dg, and iC3b (inactive C3b) by factor I. C3b and C3b cleavage products bind to complement receptors expressed on various cells and initiate other immune responses. Membrane-bound C3b and iC3b act as opsonins by binding receptors on neutrophils and macrophages. C3d and C3dg augment B-cell responses to antigen. Converting C5 to C5a and C5b marks the activation of the terminal complement components. These events, in turn, lead to the formation of MAC by C5, C6, C7, C8, and C9. The MAC has a hydrophilic center that increases leakage of water and ions through the cell membrane, causing osmotic lysis and cell death. C1INH: This is an inhibitory protein that regulates the classical pathway by covalently attaching to C1r2-C1s2, which dissociates C1r2-C1s2 tetramer from C1q and stops activation of the classical pathway. C4BP: This regulates the classical pathway by dissembling the C4bC2b complex. C4BP binds to C4b and blocks binding of C2b. Decay-accelerating factor (DAF) and complement receptor 1 (CR1) also bind to C4b to block C4b/C2b complex formation. DAF also displaces Bb from C3b. Factor H: Factor H promotes conversion of C3b to iC3b with factor I and displaces Bb from the alternate pathway C3 convertase (C3bBb). Cell membrane rich in sialic acid has higher binding affinity to factor H than to factor B. Because mammalian cells have higher sialic acid content than microbial cells, factor H prevents excessive complement activation in host cells but not in microbes. Factor H is the major regulator in the alternate pathway activation. CD59: CD59 expressed by many cell types inhibits binding of C9 to the membrane-inserted C5b-8 complex and limits MAC formation on host cells. CD59 is not expressed by microbial cells, which allow complement-mediated microbial cell lysis, sparing host cells. Membrane cofactor protein: This is a cofactor for factor I–mediated cleavage of C3b and C4b. DAF: This accelerates decay of C3/C5 convertase. CR1: This is the receptor for C3b/C4b and has an inhibitory profile similar to MCP and DAF. Properdin: This stabilizes AP convertases. Clusterin: This blocks fluid phase MAC. S protein: This blocks fluid phase MAC. Anaphylatoxin inactivator: This inactivates C3a, C4a, and C5a. 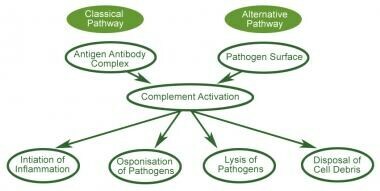 Complement system: This is an important regulator of B-cell activation. Naive B cells receive a stimulus from the B-cell receptor (BCR), leading to activation, elimination, or anergy. The strength of signal transduction of B cells and other antigen-presenting cells (eg, dendritic cells) depends not only on the affinity of antigen binding but also on positive signals via the B-cell coreceptor complex composed of CD21 (complement receptor 2 [CR2])/CD19/CD81(TAPA-1). CD21 binds to antigens via attached C3d while membrane Ig binds to the antigen. This allows an association of CD19 to BCR-associated kinases and rapid phosphorylation of the cytoplasmic tail of CD19, leading to activation of PI-3K, which, in turn, augments BCR-initiated B-cell activation signaling. Thus, the absence of CD21 expression by B cells leads to impaired humoral immune response to T-dependent antigens. This is characterized by a decrease in B-cell follicular retention and germinal center survival. C3b cleavage products have also been shown to augment immune memory; C3 receptors expressed on dendritic cells bind to both immune complexes and antigen alone. CD21 (CR2) expressed on follicular dendritic cells serves to trap iC3b-coated and C3dg-coated antigen-antibody complex in the germinal center. Deficiencies of the complement components have been reported for most of the constituents. These deficiencies can be inherited or acquired and complete or partial. Deficiency of early components of classical pathway (C1, C4, C2): Autoimmune disease, especially systemic lupus erythematosus (SLE), is the most common presentation in patients with early component deficiency. The incidence rates of SLE in individuals with C1q and C4 are reported to be around 90% and 75%, respectively. Patients with C2 deficiency develop SLE with lesser frequency (around 15%). The proposed mechanisms of high incidence of autoimmune diseases include impaired clearance of immune complex and apoptotic cells and loss of complement-dependent B-cell tolerance. Recurrent bacterial infection is common in patients with C2 deficiency. Atherosclerosis also appears to occur at a higher frequency in individuals with C2 deficiency. MBL deficiency is linked with frequent pyogenic infection, including pneumococcal infection in infants and young children. Severe pneumococcal disease is also reported in patients with MASP-2 deficiency. In addition, MBL deficiency is 2-3 times as common in patients with SLE as in the general population. Others also report an increase in cardiovascular diseases associated with atherosclerosis in patients with MBL deficiency. Schizophrenia is a severe mental disorder, with worldwide prevalence of 1–1.5%. Immunological research in schizophrenia indicates that infectious or autoimmune processes might play a role in the etiopathogenesis. The complement system is a major mediator of innate immune defense against infection and contributes to many functions of the immune system including inflammation, opsonization and cell lysis. MBL activates the complement system via the lectin pathway. Inherited MBL deficiency, common in most human populations, predisposes to infectious and autoimmune diseases. A modulatory role for MBL in autoimmune disease has been reported. Investigations in Denmark and Hong Kong have suggested that MBL variant alleles are associated with both severity and early onset of disease in patients with rheumatoid arthritis. However, patients with late-onset disease who were also homozygous for wild-type MBL genes were more likely to show evidence of persistent inflammation. Alternative pathway (properdin, factor B, factor D): This is associated with severe fulminant neisserial infections with a high mortality rate. C3, factor H, and factor I: Deficiency of these factors predisposes individuals to severe pyogenic bacterial infections. Factor H and factor I deficiencies cause secondary C3 deficiency with C3 consumption and impose the same infectious risk as primary C3 deficiency. Factor H deficiency is also associated with atypical (diarrhea-negative) hemolytic-uremic syndrome (HUS) and glomerulonephritis. C3 deficiency is associated with membranoproliferative glomerulonephritis. Terminal pathway (C5-C9): The lack of MAC formation results in severe recurrent infection by Neisseria gonorrhoeae or Neisseria meningitidis. C1INH: Primary and secondary deficiency of C1INH leads to uninhibited cleavage of C4 by C1s. Hereditary angioedema (HAE) is caused by heterozygous deficiency of C1INH and characterized by recurrent episodes of angioedema, which usually subside within 48-72 hours. C1INH is a regulator for C1r/C1s, as well as for Hageman factor, clotting factor XI, plasma kallikrein, and plasmin. Angioedema is caused by various mediators that involve these pathways. DAF and CD59: Defects of these 2 regulatory proteins make erythrocytes highly susceptible to complement-mediated cell lysis. This is typically seen in patients with paroxysmal nocturnal hemoglobinuria (PNH), which has clinical features that are characterized by hemoglobinuria and venous thrombosis of major vessels. Complement deficiency can be acquired or inherited. Acquired deficiency may be acutely caused by infection or in conjunction with chronic rheumatological or autoimmune disorders. Inherited deficiency is rare in the general population, with an estimated frequency of 0.03%, excluding MBL deficiency. MBL deficiency is thought to be fairly common, with a 3% frequency in general population. Likewise, MASP-2 deficiency may also be very common. Among C1-C9 components, C2 deficiency is the most common, with an incidence rate of 1 case per 10,000 population. Properdin deficiency is associated with a high mortality rate due to fulminant infection with N meningitidis. Primary and secondary C3 deficiency present with severe recurrent pyogenic infections early in life, similar to those observed in patients with hypogammaglobulinemia, leading to high comorbidity. Secondary C3 deficiency occurs in factor H or I deficiency. Most complement deficiencies equally affect males and females; however, properdin deficiency is X-linked recessive (ie, only males are affected). The male-to-female ratio of SLE is equal in patients with C1q and C4 deficiency. In general, SLE in individuals with complement deficiency is characterized by onset at earlier age, photosensitivity, and lower frequency of renal involvement. Patients with C2 deficiency and SLE typically present with low or negative antinuclear antibody (ANA) or anti-dsDNA antibody. Serum bactericidal activity (ie, bacterial lysis mediated by complement in the presence of specific antibody) is the main host defense against meningococcal disease. Newborns and infants are protected by maternal-derived transplacental IgG antibodies. Susceptibility is highest in children aged 3-24 months. Thereafter, the incidence of meningococcal disease declines as serum bactericidal activity against the various N meningitidis serogroups develops following nasal colonization. Ninety percent of all meningococcal disease occurs in children younger than 2 years. The median age of patients presenting with their initial episode of meningococcal disease is 3 years in the general population and 17 years in individuals with late complement component deficiency. Clarke EV, Weist BM, Walsh CM, Tenner AJ. Complement protein C1q bound to apoptotic cells suppresses human macrophage and dendritic cell-mediated Th17 and Th1 T cell subset proliferation. J Leukoc Biol. 2014 Nov 7. [Medline]. Garred P, Pressler T, Madsen HO, et al. Association of mannose-binding lectin gene heterogeneity with severity of lung disease and survival in cystic fibrosis. J Clin Invest. 1999 Aug. 104(4):431-7. [Medline]. Tedesco F. Inherited complement deficiencies and bacterial infections. Vaccine. 2008 Dec 30. 26 Suppl 8:I3-8. [Medline]. Daures M, John M, Balter CV, Simon O, Barguil Y, Missotte I, et al. Relationships Between Clinico-Epidemiological Patterns of Invasive Meningococcal Infections and Complement Deficiencies in French South Pacific Islands (New Caledonia). J Clin Immunol. 2014 Oct 29. [Medline]. Janzi M, Sjoberg R, Wan J, Fischler B, et al. Screening for C3 deficiency in newborns using microarrays. PLoS ONE. 2009. 4(4):e5321. [Medline]. [Full Text]. AAP 2000 Red Book. Report of the Committee on Infectious Diseases. 25th ed. 2000. 56-7. Carroll MC. CD21/CD35 in B cell activation. Semin Immunol. 1998 Aug. 10(4):279-86. [Medline]. Cicardi M, Castelli R, Zingale LC, Agostoni A. Side effects of long-term prophylaxis with attenuated androgens in hereditary angioedema: comparison of treated and untreated patients. J Allergy Clin Immunol. 1997 Feb. 99(2):194-6. [Medline]. Cohen J. Meningococcal disease as a model to evaluate novel anti-sepsis strategies. Crit Care Med. 2000 Sep. 28(9 Suppl):S64-7. [Medline]. Endo M, Ohi H, Ohsawa I, et al. Complement activation through the lectin pathway in patients with Henoch-Schonlein purpura nephritis. Am J Kidney Dis. 2000 Mar. 35(3):401-7. [Medline]. Frank MM. Complement deficiencies. Pediatr Clin North Am. 2000 Dec. 47(6):1339-54. [Medline]. Jackson LA, Schuchat A, Reeves MW, Wenger JD. Serogroup C meningococcal outbreaks in the United States. An emerging threat. JAMA. 1995 Feb 1. 273(5):383-9. [Medline]. Jansen AG, Sanders EA, Hoes AW, van Loon AM, Hak E. Effects of influenza plus pneumococcal conjugate vaccination versus influenza vaccination alone in preventing respiratory tract infections in children: a randomized, double-blind, placebo-controlled trial. J Pediatr. 2008 Dec. 153(6):764-70. [Medline]. Kainulainen L, Peltola V, Seppänen M, Viander M, He Q, Lokki ML, et al. C4A deficiency in children and adolescents with recurrent respiratory infections. Hum Immunol. 2012 Feb 26. [Medline]. Kang HJ, Kim HS, Lee YK, et al. High incidence of complement C9 deficiency in Koreans. Ann Clin Lab Sci. 2005. 35(2):144-8. [Medline]. Kumar A, Gupta R, Varghese T, et al. Anti-C1q antibody as a marker of disease activity in systemic lupus erythematosus. Indian J Med Res. 1999 Dec. 110:190-3. [Medline]. Levi M, Choi G, Picavet C, Hack CE. Self-administration of C1-inhibitor concentrate in patients with hereditary or acquired angioedema caused by C1-inhibitor deficiency. J Allergy Clin Immunol. 2006 Apr. 117(4):904-8. [Medline]. Manderson AP, Botto M, Walport MJ. The role of complement in the development of systemic lupus erythematosus. Annu Rev Immunol. 2004. 22:431-56. [Medline]. Momeni N, Bergquist J, Brudin L, Behnia F, Sivberg B, Joghataei MT. A novel blood-based biomarker for detection of autism spectrum disorders. Transl Psychiatry. 2012. 2:e91. [Medline]. Moroni G, Trendelenburg M, Del Papa N, et al. Anti-C1q antibodies may help in diagnosing a renal flare in lupus nephritis. Am J Kidney Dis. 2001 Mar. 37(3):490-8. [Medline]. Notarangelo L, Casanova JL, Conley ME, et al. Primary immunodeficiency diseases: an update from the International Union of Immunological Societies Primary Immunodeficiency Diseases Classification Committee Meeting in Budapest, 2005. J Allergy Clin Immunol. 2006 Apr. 117(4):883-96. [Medline]. Ross SC, Densen P. Complement deficiency states and infection: epidemiology, pathogenesis and consequences of neisserial and other infections in an immune deficiency. Medicine (Baltimore). 1984 Sep. 63(5):243-73. [Medline]. Rougier N, Kazatchkine MD, Rougier JP, et al. Human complement factor H deficiency associated with hemolytic uremic syndrome. J Am Soc Nephrol. 1998 Dec. 9(12):2318-26. [Medline]. Salzman MB, Rubin LG. Meningococcemia. Infect Dis Clin North Am. 1996 Dec. 10(4):709-25. [Medline]. Sjoholm AG, Jonsson G, Braconier JH, et al. Complement deficiency and disease: an update. Mol Immunol. 2006 Jan. 43(1-2):78-85. [Medline]. Sturfelt G, Truedsson L. Complement and its breakdown products in SLE. Rheumatology (Oxford). 2005 Oct. 44(10):1227-32. [Medline]. Sullivan KE. Genetics of systemic lupus erythematosus. Clinical implications. Rheum Dis Clin North Am. 2000 May. 26(2):229-56, v-vi. [Medline]. Ten RM, Carmona EM, Babovic-Vuksanovic D, Katzmann JA. Mannose-binding lectin deficiency associated with neutrophil chemotactic unresponsiveness to C5a. J Allergy Clin Immunol. 1999 Aug. 104(2 Pt 1):419-24. [Medline]. U. S. Department of Health and Human Services. Control and Prevention of Meningococcal Disease and Control and Prevention of Serogroup C Meningococcal Disease: Evaluation and Mangement of Suspected Outbreaks. Morbidity and Mortality Weekly Report. February 14, 1997. 46:[Full Text]. van Geffen M, Cugno M, Lap P, Loof A, Cicardi M, van Heerde W. Alterations of coagulation and fibrinolysis in patients with angioedema due to C1-inhibitor deficiency. Clin Exp Immunol. 2012 Mar. 167(3):472-8. [Medline]. Walport MJ. Complement. First of two parts. N Engl J Med. 2001 Apr 5. 344(14):1058-66. [Medline]. Weiss SJ, Ahmed AE, Bonagura VR. Complement factor D deficiency in an infant first seen with pneumococcal neonatal sepsis. J Allergy Clin Immunol. 1998 Dec. 102(6 Pt 1):1043-4. [Medline]. Wen L, Atkinson JP, Giclas PC. Clinical and laboratory evaluation of complement deficiency. J Allergy Clin Immunol. 2004 Apr. 113(4):585-93; quiz 594. [Medline]. West CD, McAdams AJ. The alternative pathway C3 convertase and glomerular deposits. Pediatr Nephrol. 1999 Jun. 13(5):448-53. [Medline]. Whaley K, Ruddy S. Modulation of C3b hemolytic activity by a plasma protein distinct from C3b inactivator. Science. 1976 Sep 10. 193(4257):1011-3. [Medline]. Wiertsema SP, Herpers BL, Veenhoven RH, et al. Functional polymorphisms in the mannan-binding lectin 2 gene: effect on MBL levels and otitis media. J Allergy Clin Immunol. 2006 Jun. 117(6):1344-50. [Medline]. Williams DG. C3 nephritic factor and mesangiocapillary glomerulonephritis. Pediatr Nephrol. 1997 Feb. 11(1):96-8. [Medline].